You guys….I’m about to rock your world! Why? Because I’m giving you a family favorite recipe that just also happens to be one of the EASIEST recipes around (not to mention tasty). The best part? The main part is only 3 ingredients! 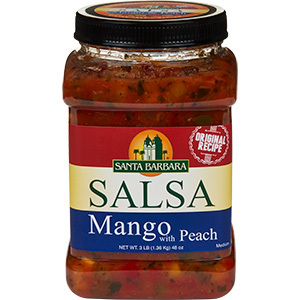 We use the Mango-Peach Salsa from Costco and it is amazing! Cook for 4-6 hours on high, or 5-7 on low (varies depending on slow cooker). Basically you just want your chicken cooked all the way through. About an hour before it’s done, shred the chicken and put it back in the pot. 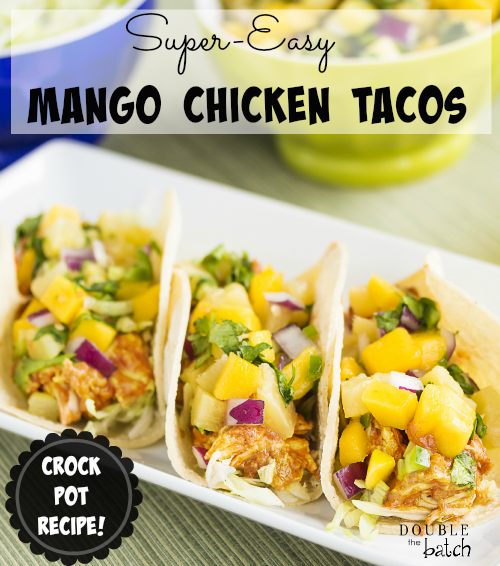 Serve on corn or flour tortillas with all of your favorite toppings (The above pic has extra chopped mangos on top for visual appeal. Totally not necessary). We like to use black beans, tomato, sour cream, and lettuce. The best part about this meal is that is tastes awesome a variety of ways! We usually have it as tacos the first night, followed by burritos or nachos the 2nd night, and if there’s still some left on day #3, you can toss it on a salad! It’s the dish that just keeps giving. Which means it’s the dish that keeps me from cooking for several days in a row. Which means it’s awesome.